During this year of reflection and accomplishments, we embarked on consultative, reflective and planning processes, including our inaugural Annual Report, the Faculty Self-Study, External Review and Academic Plan. We launched cross-Faculty education and research initiatives, enhanced our connections through our revitalized website, and recognized colleagues’ accomplishments at our Celebrating Engineering Success event. Our academic priorities and process transparency drive the recently implemented new budget model, and we continue to address our physical space requirements through infrastructure renewal and ongoing planning. We are also pursuing strategic fundraising initiatives and further strengthening our ties with alumni and donors. 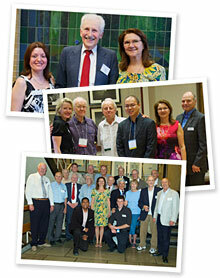 Some of our Faculty’s activities and accomplishments are highlighted in this year-end issue. My thanks to you for your many different contributions to our thriving Faculty – you inspire our continued pursuit of excellence. At this time of the year, we celebrate more than 1,000 of our graduating students, now our newest alumni. Despite the rainy start of our convocation celebrations on June 16, it didn’t dampen our spirits. Our heartfelt congratulations to five staff members who also graduated this month – an extraordinary achievement while working full time. I wish you and your families an enjoyable, productive and revitalizing summer. I look forward to another rewarding year together. 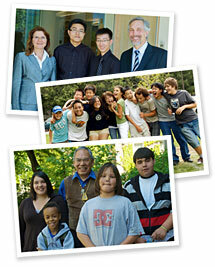 2009-2010 was another year filled with exciting activities, inspiring beginnings and great rewards. 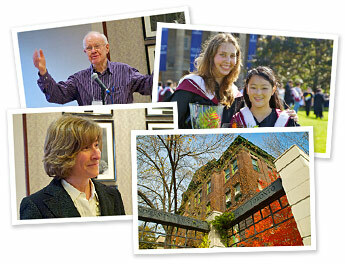 Please check out our photo slideshow of people and events throughout the year. In November, we produced the Faculty’s inaugural Annual Report of performance indicators, metrics and statistics. We compiled 2008-2009 data and compared it to the Faculty’ historical data as far back as 2000 and with peer institutions. This document sets the milestones by which we measure our progress, and over the summer, we will compile and publish the 2009-2010 annual report. Our Faculty Self-Study drew upon the Annual Report. Through a highly consultative, intensive process we reflected on our accomplishments and evolution over the past five years. 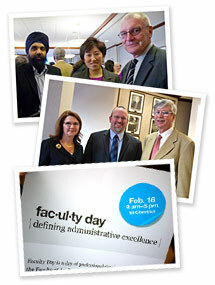 This document identified our Faculty’s strengths, opportunities and challenges. It also became a foundational document for the external review. In addition, the self-study set our sights for the ongoing academic planning. assess a number of aspects of our Faculty; they praised us for our accomplishments and performance over the past five years. The forthcoming report will provide an overall assessment of our strengths and will identify areas of opportunity and future growth as a Faculty. In summer 2009, we established a steering committee to consider the Faculty’s Academic Planning process, and we developed the Academic Planning Framework. Between January and May 2010, divisions, departments, institutes and administrative units developed their responses to this framework. These documents, combined with the Annual Report, Faculty Self-Study and the external review report will be integrated into the Faculty’s academic plan through a collaborative, iterative and collective process. We look forward to this exciting time of renewal and envisioning our Faculty’s academic directions for the next five to seven years. A first for our Faculty, we formally engaged administrative and technical staff in the academic planning process at the Defining Administrative Excellence Workshop, held in February 2010. Participants developed a strategic plan for administrative and technical functions, identified three levels where administrative staff collaborate for excellence and defined four visions of excellence. The final report is available online. In April 2010, our revamped website went live. Its fresh, clean look dovetails with the Faculty's renewed visual identity and provides the structural basis for all other administrative and academic sites to come. Our immediate goal: a seamless, effective and cohesive online presence for all Engineering sites. Our newsletter series has grown from one to three to reach new audiences in new ways. Similarly modelled to the Engineering Newsletter for faculty and staff, the new monthly students and alumni e-newsletters, told through the experience of each audience, showcase our Faculty's timely and pertinent information. According to the Times Higher Education-QS World University Rankings and the US News and World Report, our Faculty stands eighth in the world and first in Canada for Engineering and Information Technology. Also, in the 2009 Shanghai Jiao Tong Academic Ranking of World Universities (ARWU), U of T Engineering moved up two spots to #19 in the world, and we remain the premier institution in Canada for the third consecutive year. While no one ranking truly reflects all aspects of our Faculty, our pre-eminence in rankings illustrates the impact of our collective efforts and achievements. These exceptional rankings also strengthen our ability to recruit the best and brightest applicants and scholars. In collaboration with the Engineering Society, we hosted two Dean’s Town Halls for undergraduate students where we learned more about their perspectives, concerns and answered their questions. We shared the Faculty’s progress and challenges and, in turn, asked questions of our students. This forum will continue in 2010-2011 as a venue to strengthen communications with students. More than 150 faculty and staff attended the Faculty’s third annual Celebrating Engineering Success Reception on April 22 to recognize our award and research grant recipients. This year, the event featured the presentation of our four new staff awards (Emerging Leader, Influential Leader, Innovation and Quality of Student Experience), the revamped Agnes Kaneko Citizenship Award, the McCharles Prize, and our two teaching awards. 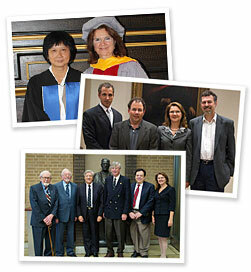 Our Faculty received an increasing number of external awards in 2009-2010, including 17 faculty and alumni inducted into the Canadian Academy of Engineering, two Killam Research Fellowships, one NSERC Synergy Award for Innovation and the NSERC Brockhouse Canada Prize, as well as international honours such as an inductee into the National Academy of Engineering and four new fellows of the American Association for the Advancement of Science. The Engineering Student Recruitment and Retention Office focused efforts to proactively recruit top applicants, to increase women and international applicants, to reflect innovative programs and to highlight U of T Engineering strengths, including YouTube videos, TrackOne program and the Galbraith Scholars program. Recruitment and retention programs included the inaugural Calgary Chapter student send-off event, coaching, mentorship, Success 101, ReFresh, the T-Program and the New College International Foundation Program. We implemented recommendations of the Outreach Task Force to align with the Faculty’s mission, values and resources – including branding materials and the evaluation on the Engineering Student Outreach Office’s three primary purposes: student experience, recruitment and community impact. Some of the many outreach initiatives include DEEP Summer Academy, Jr. DEEP, Saturday Science and Engineering Academy and cultural diversity programs. Our efforts yielded encouraging results. In fall 2009, we admitted 1,201 First Year students to Engineering with an entering average of 88.9 % and our retention increased to 93.4 %. We welcomed the most culturally diverse cohort in our Faculty’s history, from nine Canadian provinces, 61 countries and every continent. International students represent 18.4 % of the First Year class, with the highest percentage coming from five countries: China, Malaysia, India, Pakistan and South Korea. Our 2009-2010 First Year class included 23.9 % women, the highest percentage since 2003. Our Faculty is Canada’s leading teaching and research-intensive engineering school, reflected in the calibre of undergraduate and graduate programs, commensurate with our outstanding faculty, staff and academically strong, diverse students we attract from around the world. Housed in the Cross-Disciplinary Office, engineering minors and certificates offer our students flexibility in their studies to further enhance their educational experience at the Faculty. Under the new undergraduate academic certificate guidelines, we are developing a Certificate in Global Engineering to add to the two existing certificates. Our three undergraduate minors – Bioengineering Minor, Sustainable Energy Minor, and Environmental Engineering Minor – enrolled more than 500 students this year – and interest continues to grow. Minors achieve depth and breadth in important areas of study and provide an identifiable academic certification recognized by prospective employers and graduate schools. This year, we developed a new BASc in Engineering Science, the Engineering Mathematics, Statistics and Finance, with its first cohort of 40 students, starting in autumn 2010. A first of its kind in Canada, this undergraduate program provides students with a strong background in mathematics and statistics, and integrates these disciplines within quantitative finance through the use of engineering tools. Students will learn about financial theory that governs the dynamics of financial instruments and markets, which influence our global community. 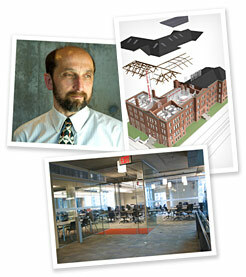 The Centre for Global Engineering (CGEN) has been building momentum. This Faculty-wide initiative prepares graduates for a global workplace and directs research towards international challenges. CGEN supports both the education and research missions of the Faculty by promoting interdepartmental, interdivisional and interdisciplinary research and other scholarly activities related to Engineering in a global environment. In May 2010, Faculty Council approved the establishment of the Institute for Leadership Education in Engineering (ILead), emerging from the Report of the Dean’s Task Force on Engineering Leadership Education. A first for engineering in Canada, ILead will offer curricular, co-curricular and extracurricular leadership education and development in a three-fold manifest of teaching, research and outreach. Read more about ILead. We continue to reward excellence in teaching through the revitalization of the Teaching Awards and the establishment of a new Teaching Assistant Award. To date, the Excellence in Engineering Education program has addressed the topics of teaching large classes and teaching tools and technologies, and will build more teaching effectiveness initiatives in the year to come. As we strive to provide a graduate education that fosters the next generation of global engineering leaders, innovators, researchers and educators, our Faculty’s graduate education was enhanced with a combined degree and certificate, as well as a unique co-curricular program. Growing enrolment in our Master of Engineering professional master’s program demonstrates heightened interest, and as we standardize fast-tracking across the Faculty, the number of exceptional MASc students moving directly into the PhD program has increased. We further developed the Entrepreneurship, Leadership, Innovation and Technology in Engineering Certificate to include thirteen courses, initiated the Engineering and Public Policy certificate, and enhanced the Prospective Professors In Training program. Starting this autumn, graduate students will be able to earn a Graduate Certificate in Engineering and Globalization. Visit the Graduate Studies website. To further enable cross-Faculty research, we established the Faculty Research Committee that includes membership from all departments, divisions and institutes. The committee meets once a month to brainstorm project development and facilitation across departments, and to improve the Faculty’s success rate in research funding applications. 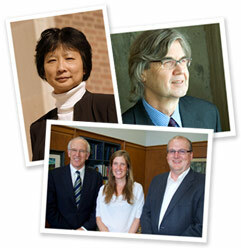 The larger departments (ChemE, CivE, ECE and MIE) also created Associate Chairs of Research positions. Faculty members saw their labours bear fruit in prestigious and significant grants this past year, and our Faculty ranks first among all Canadian universities in NSERC grants received. Our researchers were awarded twelve NSERC Strategic Grants in September 2009, with a combined value of $4.88 million, and representing a successful application rate of nearly one in two. Three out of 20 NSERC CREATE Program (Collaborative Research And Training Experience) grants awarded in Canada went to Faculty researchers: two in bioengineering and one in nanotechnology. Professor Elizabeth Edwards (ChemE) received the NSERC Synergy Award in October 2009 for her research partnership with Geosyntec, focused on developing effective techniques that use bacteria to clean up contaminated groundwater sites. In early 2010, Professor Chul Park (MIE) was awarded a NSERC Strategic Research Network grant in Plastic Materials and Manufacturing Processes, a major research project in partnership with universities and industry. Further industrial collaborations included Professor R. Doug Hooton (CivE) who was named the NSERC Industrial Research Chair in Concrete Durability and Sustainability and Professor Tom Chau (IBBME) who was renewed in the Canada Research Chair in Pediatric Rehabilitation Engineering. A total of $8.2M in funding from the Ontario Research Fund (ORF) Research Excellence Program was awarded in 2010: Professor Ted Sargent (ECE) for solar energy research; Professors Javad Mostaghimi (MIE), Tom Coyle (MSE) and Sanjeev Chandra (MIE) for research on high-efficiency spray-formed metal foam heat exchangers for high-temperature energy conversion and recovery; and, Professor Ramin R. Farnood (ChemE) as a member of the Faculty of Forestry team, led by Professor Ning Yan, researching on bark biorefinery. The Centre for Sustainable Energy (CSE) opened in March 2010 to facilitate the advancement and development of cleaner and more efficient energy production in Canada. By bringing together research on energy-related activities throughout the University, and by organizing seminars and events with an energy-related theme, the centre will facilitate connections between researchers, students, teachers who will lead multidisciplinary research projects to solve complex sustainability problems. Visit the CSE web site. The Institute for Robotics & Mechatronics was approved in February 2010 by Faculty Council. This timely initiative responds to the rapid development of fundamental enabling technologies, including micro-electromechanical systems, signal processing, systems control and nanotechnology. The Institute will enhance and coordinate the large number of academic and research activities already underway at the Faculty. Shortly after the University implemented its new budget model in 2006-2007, we started to structure our own methodology to allocate budget funding to our academic units based on similar principles. The intent is to give departments and institutes incentives to increase revenues and contain costs, as well as provide transparency to the budget process. What has not changed is that our decisions will continue to be driven by academic priorities. As with the University’s model, our new methodology attributes revenues and expenses to the Faculty’s academic units. The revenues flowed to academic units are based primarily on student enrolments, but the model also includes a “budget preservation” mechanism associated with numbers of academic staff, since enrolments can fluctuate greatly year-to-year while academic appointments usually have a 30- to 40-year lifespan. The expenses charged relate to costs that can be influenced at the departmental level, which at this time are space and research administration. Each unit pays only for the occupying space, promoting efficient use of space. As well, each unit pays the cost of central research administration commensurate with their research funding. We implemented this new budget allocation process in May 2010. We are addressing the findings of the comprehensive Divisional Space Review which determined that our current physical space no longer meets our needs as a world leader in engineering education and research. Our work to rectify this continues, as outlined below, with more yet to come. Projects Completed: Decanal Suite Consolidation / Engineering Science Student Space Upgrade / Sandford Fleming - Atrium Renovations / Galbraith Building - Registrar’s Office / Galbraith Building - Room 451 - ECE Research Lab. 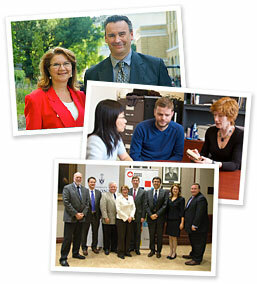 The Faculty continues to pursue strategic fundraising initiatives to ensure a robust future for Engineering at U of T. The Advancement Office restructuring, an enhanced and comprehensive development effort, along with a more expansive alumni and student outreach and redesigned websites are setting the stage for a stronger, prominent Faculty. New initiatives included: BizSkule™, Calgary Skule™ Alumni Chapter, renewal of the Engineering Alumni Association (EAA), Student Thank-a-thons, Reunion and Class Giving, and the return of Graditude. In February, the Dean, Vice-Deans, Chairs and Directors joined other University academic leaders for a series of advancement workshops to strengthen and promote philanthropic fundraising skills. The Skule™ Society program, which recognizes donors giving $1,200-24,999, exceeded its target, and funds raised will be used to enrich student experience, provide scholarships and support faculty excellence. These and other activities helped deliver outstanding donor and alumni support, including the Mining Building expansion, Engineering Leaders of Tomorrow Program, and graduate and undergraduate scholarships. Over the past year, with active participation from professors, we reached out to a wide spectrum of alumni, friends and stakeholders to assess their interests in supporting the Faculty. In addition to meetings in Toronto, we met with alumni in Calgary, Ottawa, Washington and California, all expressing their enthusiasm about the Faculty’s vision and direction and willingness to become more involved. The Division of University Advancement completed the most comprehensive external review of Advancement in the University’s history. 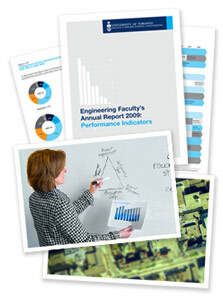 The review found ample evidence of the Faculty’s potential to grow fundraising performance, including the creation of a major institutional campaign to stimulate transformation growth, organizational realignments both divisionally and centrally to strengthen fundraising roles, and scalable investments in advancement resources. These conclusions augur well for the Faculty and the University’s planned Campaign. We thank Professor Yu-Ling Cheng (ChemE) for her three years of service as Faculty Council Speaker and welcome Professor Jonathan Rose (ECE) as Council’s Speaker. Among the items considered (available online) and approved at this year’s three meetings, Faculty Council established an Engineering Science Major in Engineering Mathematics, Statistics and Finance, the Institute for Robotics and Mechatronics and the Institute for Leadership Education in Engineering. Council approved the revisions to the name and terms of reference of the Undergraduate Curriculum Committee, the Guidelines Governing Undergraduate Academic Certificates in Engineering, and the Teaching Methods and Resources Committee’s Award Guidelines and Report. The Engineering Newsletter is a twice-monthly summary of key headlines, events and opportunities for faculty and staff in the Faculty of Applied Science & Engineering. If you have questions or comments, please contact: madelyn.herschorn@utoronto.ca.